The horns are carved from a piece of maple and painted with craft paint. Center is red felt with black thread on the ends. The plaque is also made from maple with an one step staion/poly. 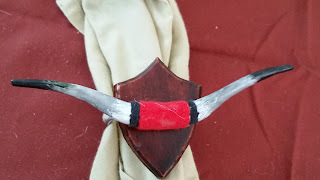 I attached the leather loop, plaque, and horns with some screws.